PRINCETON, New Jersey, May 15, 2012 (ENS) – The utility NRG Energy will build a comprehensive electric vehicle charging network in California, investing $100 million over the next four years. EV drivers will pay a fee to use the 200 publicly available fast-charging stations in the San Francisco Bay area, the San Joaquin Valley, the Los Angeles Basin and San Diego County. The fast chargers can add 50 miles of range in less than 15 minutes of charging, says NRG. The utility’s EV infrastructure commitment will include the wiring for at least 10,000 individual charging stations located at homes, offices, multifamily communities, schools and hospitals across the state. The charging network is required under a legal settlement agreement between the California Public Utilities Commission and NRG Energy that resolves outstanding litigation arising out of a long-term electricity contract entered into over a decade ago. The contract was between the California Public Utilities Commission and a subsidiary of Dynegy, Inc., then a co-owner with NRG of the portfolio of power generating plants in California that are currently owned by NRG. NRG assumed full responsibility for resolving this matter in 2006 when NRG acquired Dynegy’s 50 percent interest in the assets. The settlement requires $100 million in infrastructure investment over four years, and $20 million in cash for the California Public Utility Commission. “California already leads the way in the development of an alternative energy transportation sector and, with the price of gasoline above $4 per gallon and rising, all Americans need to be giving serious consideration to the increasingly attractive electric vehicle alternative to what former President Bush called ‘our national addiction to foreign oil’,” said Crane. “This network will be built with private funds on a sustainable business model that will allow NRG to maintain and grow the network as EV adoption grows,” Crane said. A minimum of 200 direct current (DC) fast chargers to the state. A minimum of 10,000 parking spaces retrofitted with wiring necessary to charge EVs at multifamily buildings, large worksites and civic sites such as universities and hospitals. 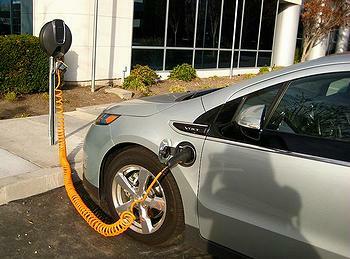 Training and jobs for the installation and maintenance of these charging stations in California. Advanced charging services that increase the speed and power of DC fast charging, store electricity to minimize peak-period demand, and enable EV drivers to support electrical grid reliability with needed energy services through vehicle to grid technology enhancement and implementation. Significant additional investment in California’s clean technology economy and hundreds of jobs in construction and EV infrastructure manufacturing, maintenance and management. In tandem with the settlement, announced in March, Governor Jerry Brown issued an executive order to drive the deployment of 1.5 million zero-emission vehicles in California by 2025. The governor further ordered that California’s target for 2050 a reduction of greenhouse gas emissions from the transportation sector shall be 80 percent less than 1990 levels.